I have been in the mood for comfort food this week. There is something about fall and winter that make me want to bake and cook foods that feel warm and like home. Since I can't eat gluten I have had to re-learn a lot of my favorite comfort foods that my mother made growing up. The dish that I struggled with the most making gluten free was macaroni and cheese. Every time I tried making it the flavor and texture was off. After approximately 10 tries I finally discovered a baked macaroni and cheese that even my husband enjoyed. The trick with a lot of gluten pasta recipes is to bake them in the oven or add a lot of spices. Now that I have baked a number of gluten free pasta dishes I love them and make pasta once a week. Last week I tried a new recipe for Quick Pasta Bolognese from the February 2013 issue of Eating Well magazine. This recipe has 13 ingredients. It takes 40 minutes of total time, 30 minutes of which is active and makes 4 servings. I did make a few modifications to the recipe. First I used gluten free pasta instead of whole-wheat. My husband and two boys love meat so I used a whole pound of lean ground beef. After the pasta was done cooking I added it to the sauce, tossed and continued cooking until the pasta was fully done. I cook my pasta until al dente and then finish cooking in the sauce. I prefer this method for pasta, it ensures that the pasta doesn't over cook and that the sauce is fully incorporated. I followed the remainder of the recipe as written. Increasing the meat in this recipe worked well. I would suggest using whole tomatoes instead of diced and crushing the tomatoes by hand. To crush my tomatoes by hand I place them in a Ziploc, seal it and then crush it between my fingers. The diced tomatoes had a texture that my husband and I weren't big fans of, but could be easily remedied by using whole tomatoes instead. Make sure to add salt before serving, this dish needs to be salted adequately for flavor. 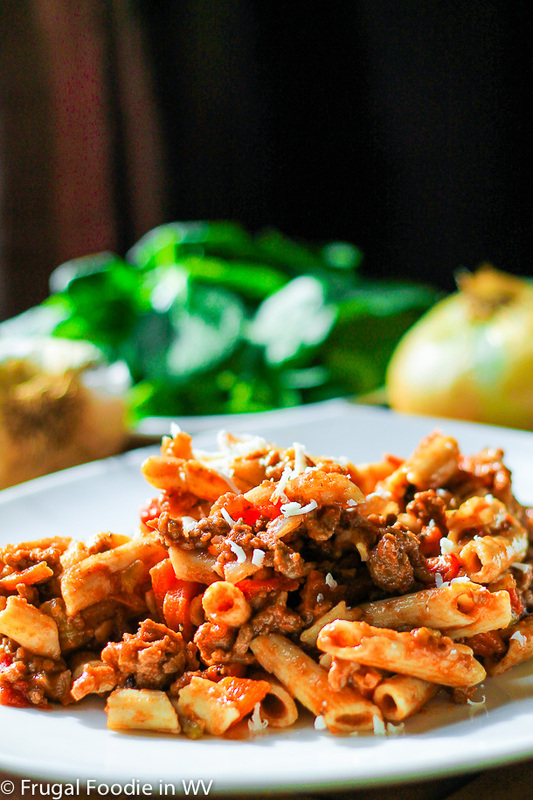 For the recipe go to Quick Pasta Bolognese. This looks wonderful. Thanks for the tips on cooking gluten free pasta. I feel like I just might be able to tackle that now. Thanks :) Gluten free pasta can be really good when prepared correctly! That's my kind of comfort food too. Really looks good! Thanks :) I love pasta! This does look comforting! I just want a big bowl and a good movie night. I love movie night, I haven't had one in a while though. Great idea! I'm a BIG fan of meals that I can make quickly like this. Especially on those nights when we have karate or baseball after school and I don't have a lot of time to cook. I'm a big fan of quick meals during the week too. There are always way too many things to do! I make something similar that has become a staple in our home!